Do you ever get in a vegetable rut? Spinach and broccoli are pretty standard in my house, but sometimes I look around the market in amazement at all the other nutritional possibilities. This weekend I randomly bought bok choy. Bok choy or leafy Chinese cabbage is one of the popular mainland crops in China, Philippines, Vietnam and other oriental regions. Nonetheless, this humble Brassica family vegetable has gained popularity even in the western world for its sweet, succulent nutritious stalks. According to Nutrition and You, here are the healthy benefits of Bok Choy. 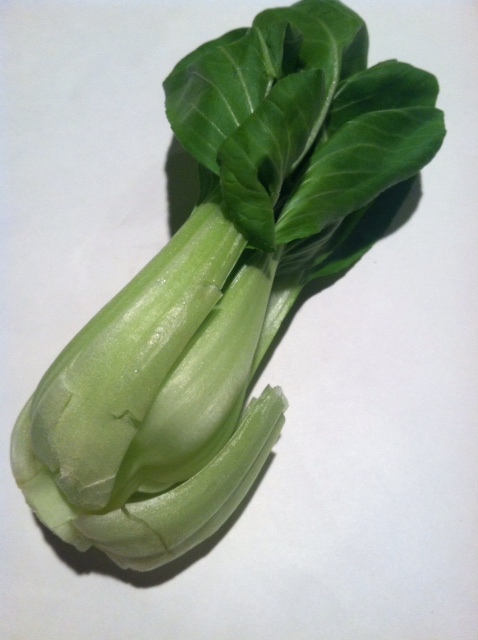 Bok choy is one of the popular leafy-vegetables very low in calories. Nonetheless, it is very rich source of many vital phyto-nutrients, vitamins, minerals and health-benefiting anti-oxidants. 100 g of bok choy contains just 13 calories. It is one of the recommended vegetables in the zero calorie or negative calorie category of foods which when eaten would add no extra weight to the body but in-turn facilitate calorie burns and reduction of weight. As in other Brassica family vegetables, bok choy too contains certain anti-oxidant plant chemicals likethiocyanates, indole-3-carbinol, lutein, zea-xanthin, sulforaphane and isothiocyanates. Along with dietary fiber, vitamins these compounds help to protect against breast, colon, and prostate cancers and help reduce LDL or "bad cholesterol" levels in the blood. Bok-choy has more vitamin A, carotenes, and other flavonoid polyphenolic anti-oxidants than cabbage, cauliflower, etc. Just 100 g of fresh vegetable provides 4468 IU or 149% of daily-required levels vitamin A.
Pak choi is a very good source of vitamin K, provides about 38% of RDA levels. Vitamin-K has a potential role in bone metabolism by promoting osteotrophic activity in bone cells. Therefore, enough vitamin K in the diet makes your bone stronger, healthier and delay osteoporosis. Further, vitamin-K also has established role in curing Alzheimer's disease patients by limiting neuronal damage in their brain. Fresh bok choy has many vital B-complex vitamins such as pyridoxine (vitamin B6), riboflavin, pantothenic acid (vitamin B5), pyridoxine, and thiamin (vitamin B-1). These vitamins are essential in the sense that our body requires them from external sources to replenish. My daughter enjoyed munching on it raw, but I decided to take out my wok and steam it. The spicy and crunchy side dish is both cleansing and satisfying. 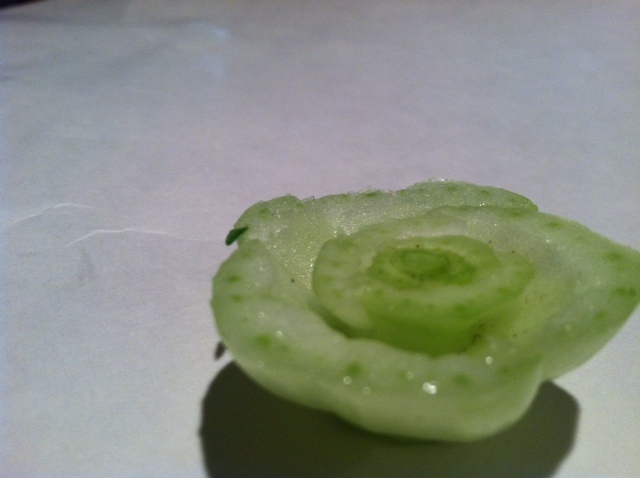 Cut up bok choy into bite sized pieces. Add oil to wok and add minced garlic until hot. 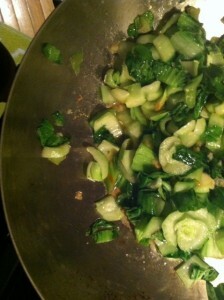 Add bok choy and water and cover to steam for 2 to 3 minutes. Remove lid and mix in Siracha and lemon juice. Salt and pepper to serve. Which vegetable do you eat the most of? Any new vegetables you want to incorporate in your diet?